The Loch Ness monster hunter is making me a cup of coffee and I just can’t stop thinking about how normal he seems. It was a little over twenty-five years ago that Steve Feltham gave up his house, his girlfriend and his job to move into a camper van at the end of a parking lot next to the stony beaches of Loch Ness in the Scottish Highlands to search for a mythical monster. He doesn’t have a single regret. This could be just a story about a man looking for a monster that he may never find. It’s more than that. It could be the story of a mad man. It’s not that either. And yet the first thing he says to me is quite ordinary. “Shall I put the kettle on?” he asks. What is a monster hunter supposed to look like? I’d asked myself this very question during my twenty-minute cab ride from Inverness to the shores of the famous lake. Unhinged, was the answer I came up with, a wild man of sorts, the kind of person you cross the street to avoid because they’re muttering to themselves and haven’t bathed in weeks. I was surprised to find Feltham decidedly hinged. No one would glance at him twice on the street or in a pub. He’s wearing a conservative grey sweater vest over a button down shirt and the same khaki pants owned by my father-in-law back in Milwaukee. On his feet are North Face quilted slippers. He speaks in professorial tones typically reserved for public radio hosts and librarians. Oh, and he’s handsome like Paul Newman in The Absence of Malice with British dentistry. “I think I’m the only person to get a world record for not doing something,” he says with a chuckle. A solar panel provides electricity to the camper van, but there’s no running water and a metal bucket sits in the corner for the washing up. The windshield of the vehicle (it no longer has a steering wheel) offers a 180 view staring across Loch Ness. If anyone is going to spot the monster from their bedroom window, or anywhere really, it’s Feltham and he’ll do it right here. His story, the one that brought him to the loch, began on a family holiday from Dorset on the Channel coast to Loch Ness in 1970 when Steve was 7 years old. While visiting the loch, he happened upon an expedition of monster hunters, grown men based at the water for the entire summer looking to solve the centuries-old mystery of what kind of elusive prehistoric creature lived in the waters below. The earliest known written description of something dastardly in this loch is from the 6th Century when the Irish saint Columba claimed to encounter a fearsome water beast. Nessie, as the monster is known locally, was mentioned intermittently throughout the next 1,500 years, but it wasn’t until 1933 that a clever newspaper writer for the Inverness Courier wrote about a “monster,” spotted rolling and plunging along the loch’s surface, creating the hysteria and fascination that has existed through today. “Those monster hunters set me off. I thought, if they could do that, maybe one day I would too,” Feltham tells me as he hands me my coffee filled with copious amounts of both milk and sugar. His family returned to the loch on holiday year after year. Sometimes his parents would leave him on the shore, knowing he wouldn’t leave or even waver in his disposition towards the waves. “The loch was my babysitter then,” he adds as a wry aside. But like all childhood dreams, Feltham’s was swallowed by the expectations of a “normal life,” a steady girlfriend, an office job, a house. Then he returned to the loch on a two-week summer holiday as an adult. So he quit his job, sold his house, bought an old mobile library camper van in Dorset and moved to the shores of Loch Ness to be a full-time monster hunter. It does sound perfectly sensible when he puts it that way. Feltham owns the website domain, HaveYouSeenItYet.com, since that is the first, and sometimes last, question new people ask him. The second question is: Are you mad? The third is are you lonely? In the quarter century he’s been a fulltime Nessie Hunter, Feltham has taken part in various scientific expeditions, trawled about the loch on boats, walked the shores, spent hours of days of years staring at the slate grey waves through a telescope and met thousands of people from everywhere in the world. Feltham’s best personal sighting of Nessie came more than twenty years ago. When he first moved here full time he phoned the BBC to ask them what kind of camera he should use to document his studies of Nessie. He wanted to make sure they took him seriously when he solved the mystery. Intrigued by his story, the national network produced a small program about this man who’d given up his steady life to search for a mythical monster. 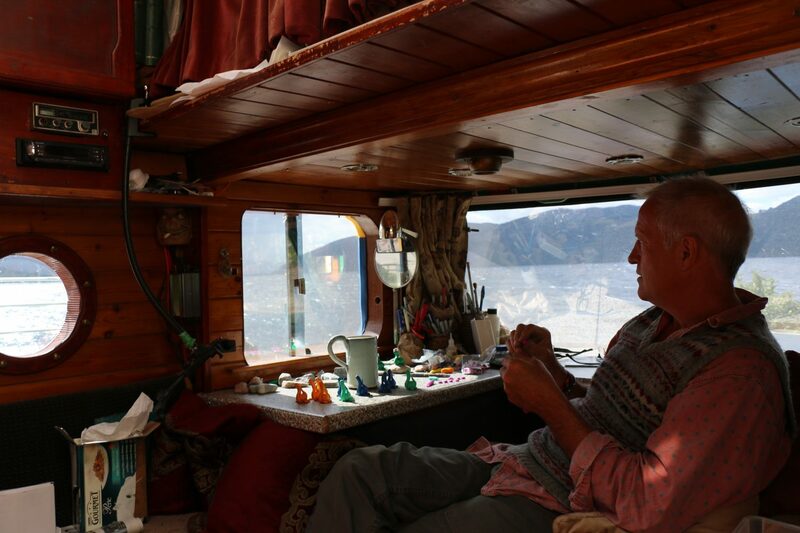 Some visitors to his camper van still tell him that his story inspired them to leave behind their own office jobs to do something they truly loved. The author Graham Holliday dedicated an entire chapter in his book to Feltham’s influence on him to quit his job to become a traveling food writer. “It happens every year and people turn up to shake my hand and say ‘it was because of your story that I quit the job I hated what I did and now I do something else,’” Feltham says with a proud smile. Loch Ness is 23 miles long and a mile wide. It’s 70 miles around by road. For the first ten years Feltham loved in Northern Scotland he just drove round and round the loch, parking and sleeping for the evening at various locations along the shore. “I was the happiest man in Europe,” he says. But the van couldn’t take the miles. 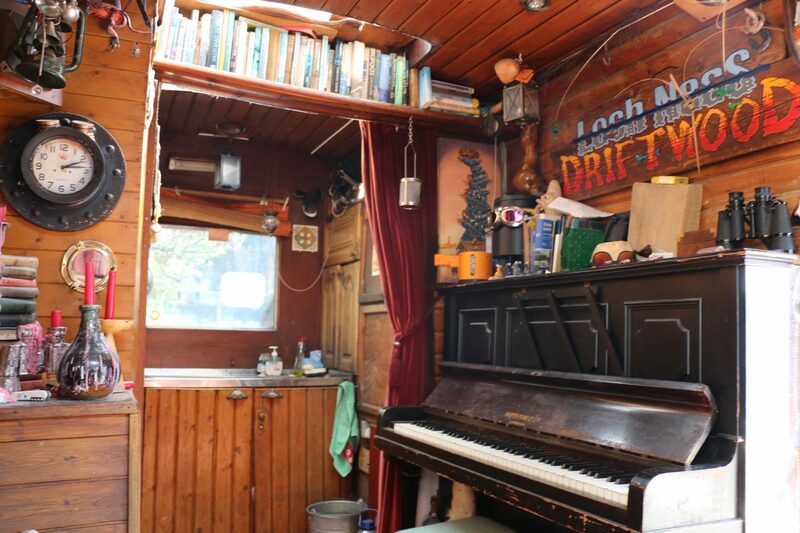 So when the owner of the Dores Inn, a pub situated on the northeastern shore of the loch, offered Feltham a bit of space at the end of the car park to set down roots and give the camper a breather, he became a permanent resident with the best possible view staring down Loch Ness. None of Feltham’s days is like any before it. “The adventures just keep coming. Be it a new piece of evidence, or some crazy boat expedition that wants me to join them, or a camera crew making a movie here on the beach. 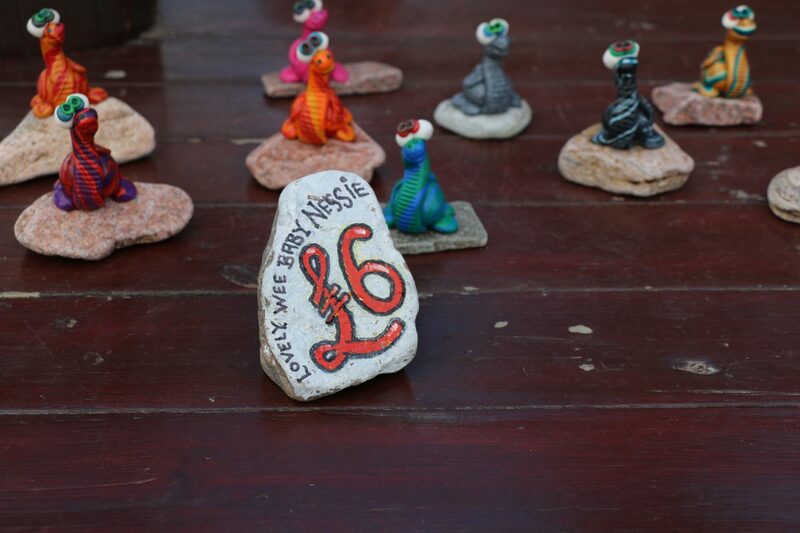 I never know which adventure is going to come next,” Feltham says as he begins to sculpt small clay models of Nessie. He sells them for between six and twenty-five pounds out on his deck and the income is enough to pay his bills (his tab at the pub, Internet and cat food). “I sell enough of these in three months that I haven’t got to worry about chasing money. I don’t need much money. Rather than money going to a mortgage it goes to things I want to do,” he says simply and honestly. As far as Loch Ness monster tourism goes, this is the lazy side of the lake and Feltham and his models are about the extent of it. The other side, where the castle sits, is home to the Loch Ness Centre and shops selling stuffed nessies, snow globes and t-shirts made in China. But on this side there’s just the Dores Inn and Feltham’s outpost. Even the loch itself is quieter than you’d expect, empty save for the odd tourist boat far on the other side. I’d expected a scrum of humanity equal to what you experience at Niagara Falls or the Grand Canyon. Last July, a freelance journalist came along and interviewed Feltham. That day he happened to mention, in an offhand way, that he thought Nessie could perhaps be a very old Wels catfish put into the lake for sport fishing around the Victorian era, and just reaching the end of a century-long life. The story went viral and Feltham now seems to regret mentioning it. Even though there’s no average day for Feltham, there is a certain rhythm to most of them. 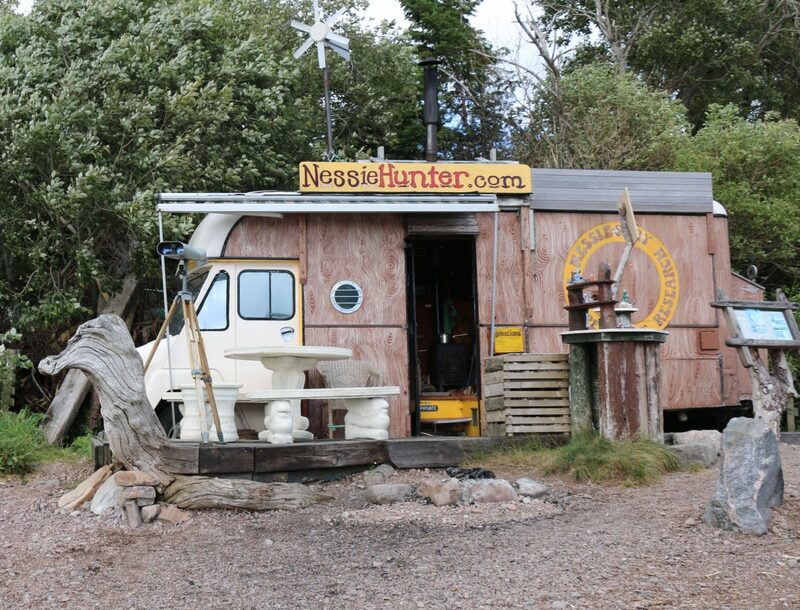 Since Feltham has established himself as the go-to authority on Nessie, any tourist who spies something strange or photographs an unusual shape anywhere along the loch is sent straight to the camper. “All bits of evidence come to me. People bring me photographs with seven humps and I let them down gently and let them know that’s a boat weight,” Feltham says. “I can’t tell you,” he says with a mischievous grin. “But it should be in the Daily Mail tomorrow. There’s one thing I need to know. It feels like the elephant, or perhaps the two-ton sea monster in the room. At the end of the day, does it even matter if Nessie is real? Or do all of us, Feltham included, enjoy the indulgence of a real life mystery more than any actual scientific explanation. In an age where we can Google everything, do we need something to remain unknown? Visit Britain with British Airways, one of Alaska’s global Mileage Plan partners. British Airways operates flights from six West Coast gateways – Seattle, San Francisco, Los Angeles, San Diego, Vancouver and San Jose – to connections throughout Europe and beyond via London. All miles flown on British Airways can be credited back to Alaska Airlines Mileage Plan to get customers to their next awards, faster.